What level of protection do you require? How many lightning induced hazardous overvoltages can you expect in a year? These questions can be answered by performing a lightning risk analysis and the results will be dependent on your location, soil type, number and length of data/mains lines coming into the building and the size of the structure etc. Use our simple on-line Risk Analysis (BS6651:1999) to find out. Note that this standard is to superseded on 31st August 2008 by BSEN62305. The Risk analysis system is currently being updated to cover this new standard. Have you any questions regarding surge protection or any of our products? Then our in-house surge doctor may be able to help. Click here. Cully Automation becomes Zymax distributor in Ireland. Low cost ZMR data reader. 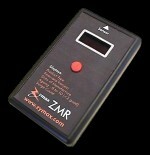 Simply point at any Zymax ZM product to check the devices MMOV aging status. Excellent for preventative maintenance! 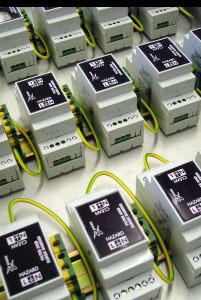 ATEX Certification now on our ZD and ZW data surge protector ranges. Jolex AB becomes Zymax distributor in Sweden. Complete solution for Miltronics flow sensors in one simple to fit package. No need for DIN rail! All DIN rail products can now be fitted as standard directly to a panel or wall without the need for costly DIN rail. 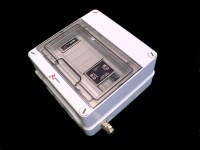 NEW compact ZD & ZW multi-line data barriers. 3 or 6 wire protection in a 2 width module with either screw or IDC terminals. ZD includes Zymax unique self test feature. ZW wideband, low line resistance version also available. ZD200 4 wire PSTN protection now available with a choice of IDC/Screw inputs and BT/RJ11 outputs. See below. UK telephone line protector ZD200BT. Incorporates high energy protection for 4 wires (6 wires connected). Test function to check the status of protection and line operation. Supplied complete with a 1M BT line cord. DIN rail mountable, can be installed in a BU1 enclosure. Also available with screw terminals, IDC and RJ11/12. Zymax presents symposium at ERA, Coventry UK on Lightning protection. Zymax RoHS, WEEE and the environment. Perform a FREE Lightning Risk Assessment to BS6651:1999 online NOW! Click here. Note that BS6651 is to be superceded on 31st August 2008 by BSEN62305. The Risk analysis system is currently being updated to cover this new standard. Patented MMOV® technology. Active monitoring of metal oxide varistor ageing. Giving visual and audible indication. Self testing MMOV® AC power-line surge protectors. Check themselves for phase reversal and earth integrity as well as continually monitoring the status of protection. ZV Video / CCTV protector. BNC 75 ohm connections. ZD data line surge protectors with unique self test function. DIN top-hat mounting. Many mounting options. 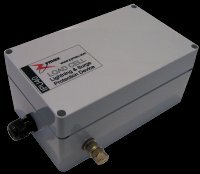 ZD200 ideal for multi-line high density PSTN line protection. ZW Wideband, low line resistance data protector ideal for fieldbus (e.g. Profibus) applications. ZP PSU spike suppression & filtering. Ideal for protecting 12 and 24V supplies. ZT 'field' Process Transmitter surge protectors. ZA co-ax protectors available with BNC, N Type & TNC connections (50/75 ohm impedance). ZM06 and ZM20 AC power products now available assembled in an IP55 enclosure complete with a fused isolator (both Live & Neutral) ready for installation. ZM20 20A AC power SPD with filtering supplied in IP55 wall mounting enclosure ready for easy installation. Replaceable DIN rail mounting protection modules also available. ZM1000 High energy 1000 Joule shunt protector for installation at power entry point. Features opto isolated remote contacts for remote annunciation and user programmable surge counter! Replaceable DIN rail mounting protection modules also available. ZMR reader. Obtains product info and protection status of any Zymax ZM (MMOV) device. Requires no physical contact with the DUT. More Zymax Application Procedures (ZAPS) and Zymax Information Pages (ZIPS).... plus lots more, so keep returning to this site to learn about the latest in Lightning and Surge Protection. ©2000-2018 Zymax International Ltd. All Rights Reserved.